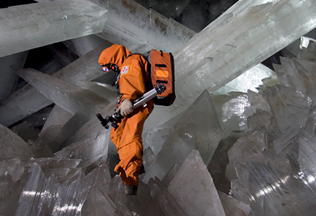 Deep in the earth is La Cuervade de Los Cristales. It is located in Mexico. Only a few scientists and film crews have been allowed to go into this wonder of nature. They literally risk their lives because of the extreme cold and delicate structures. Yet, the research goes on to investigate how such a marvel of nature was formed. Click to see a short video that will give amazing views. Turn on sound and enlarge screen for best viewing. This entry was posted on January 27, 2010 by Boyer Writes. 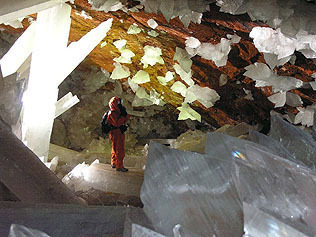 It was filed under Nature and was tagged with crystals, Mexico, Nature, Science.